The goal of this campaign is to achieve improved signage for bodies of water that are experiencing a blue-green algae (cyanobacteria) blooms. The Eastern Long Island Chapter’s Blue Water Task Force samples local waterways for bacteria that can be harmful to humans. Although they do not sample for blue-green algae (cyanobacteria), the chapter is aware of the dangers and health implications of coming into contact with a body of water with a bloom. Water sampling volunteers keep an eye on the Department of Environmental Conservation (DEC)’s Harmful Algal Blooms Notifications Page to know which of our favorite beaches are experiencing a blue-green algae blooms. Our water quality samplers noticed inconsistencies with the signs that were being posted at beaches while water bodies were experiencing blooms. and be located at the point of access in order to adequately present the health risk. 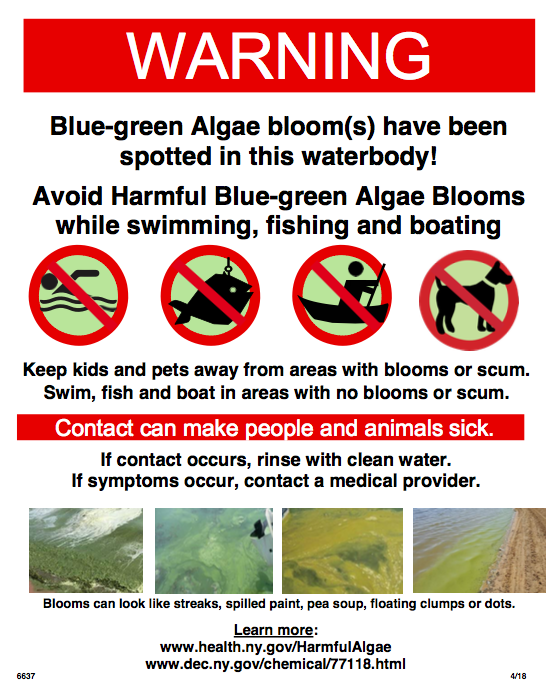 The State and County have both developed new signs to be posted in the case of Cyanobacteria Blooms! The State Department of Health released a new sign template that can be found on the NYSDOH BGA HAB web page. Each County then tailors this template and their regional needs. 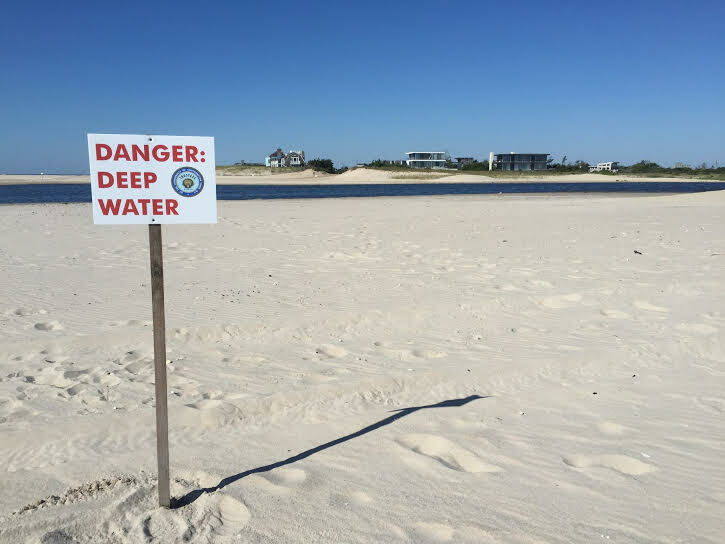 The Suffolk County Department of Health Services took this template and created their new and improved Harmful Algal Bloom Warning Sign, follow this link. Under Environmental Quality, click “Ecology,” and the sign is named “Cyano_Advisory_Non-Reg_Sign_2018.pdf.” Preview the sign below! The Chapter was able to officially call this a victory when a new and improved sign was posted in August 2018 at Sagg Pond, in Sagaponack, NY! 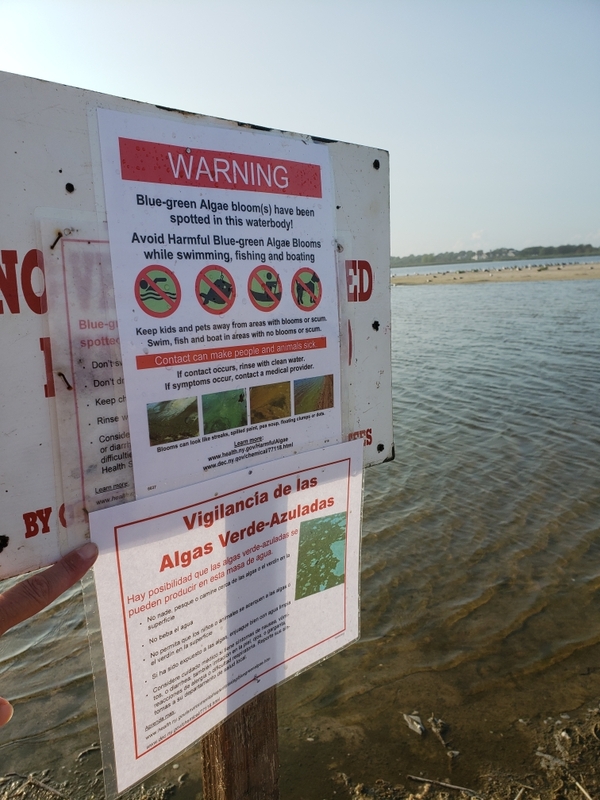 The Chapter will continue to work with all levels of government to ensure that waters with blue-green algae (cyanobacteria) blooms are posted in a timely manner. Learn more about cyanobacteria here.